The Smartphone Will See You Now -- Really? The author talks with Martin Cooper, inventor of the cell phone, and looks at the future of hearing health care. Find out how to extend the use of your hearing aid with the latest technology. 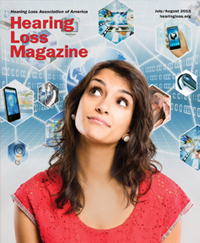 Technology is a boon to those with hearing loss, but we can’t forget the human factor. The ADA was a landmark civil rights legislation that put people with hearing loss on an equal playing field in the workplace and in public places. All the technology in the world can’t help if people won’t use or wear it. Here’s a look at why there are negative perceptions about hearing loss. Technology – It’s Never Been a Choice Not to Use It! A personal story about using technology to live successfully with hearing loss. Learn when and how to ask for reasonable accommodation and the Job Accommodation Network (JAN). HLAA’s Consumer Technology Initiative is a new online resource to make it easy for people to get this technology information in one reliable, centralized place.